"This simple recipe is so enjoyable, I tend to make it frequently when I find I don't have time to make anything else!" Bring water to boil in a medium saucepan. Stir in couscous, and remove from heat. Cover, and let stand about 5 minutes, until liquid has been absorbed. Fluff with a fork. 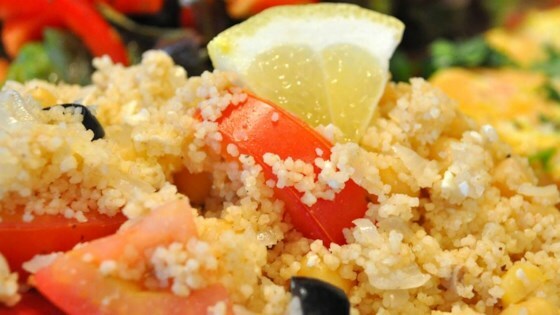 In a large bowl, mix couscous and garbanzo beans. Toss in tomatoes and cucumbers. Stir olive oil and vinegar into the mixture. Season with garlic powder, salt, and pepper. Wonderfully easy and tasty! I peppered this nicely, and didn't add any extra salt. Next time I'll try lemon juice instead of vinegar for more flavour. Thanks for this one! This was a nice and simple recipe. I added a bit more olive oil and vinegar for more of a punch. I also added sliced red onions to bulk up the veggies. I will definitely make this again.